Continuing to Leverage Innovation as a Strategic Advantage, Sunview Patio Doors Improves Productivity, Quality, and Employee Safety. Success is short-lived if a company doesn't continue to find and keep the best people, continually improve, innovate, and above all else - put customers first. This has been and continues to be the simple game plan at Sunview Patio Doors. 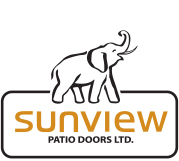 Sunview Patio Doors Ltd., a leading manufacturer of high-quality vinyl, aluminum, and hybrid patio doors announced today the completion of a series of major projects during the past year. With the goal of being the leading patio door manufacturer in North America, the company continues to leverage innovation as a strategic advantage in a highly competitive and mature market. Robotic Glass-Handling System -- Advanced machinery using suction cup robotics that eliminates the need for human hands to work directly with the glass. No more fingerprints and the sheets are always placed in the right sequence. Without people maneuvering heavy glass panes, the process is far safer, and significantly reduces the possibility of breakage. Since deployment, Sunview reports a sharp reduction in downtime, higher throughput, and more accurate delivery scheduling. UV-ToughCoat Finishing System -- Exclusive Sunview technology that fully automates vinyl preparation, cleaning, and painting with near-instant curing. All this with more precision, no over-spraying, and a finish that’s seven times harder than conventional water-based paints. Also, the new finishing system is 100% friendly for the environment and for those who operate the equipment. Folding Glass Wall System -- Uniquely crafted, this new premium folding patio door completely opens up to the outside with lengths from 8 to 52 feet. Designed for comfort and convenience, the Muskoka Folding Glass Wall System lets owners experience more of the "great outdoors" with ease. The Muskoka can also be used for many commercial and indoor applications. Sunview Patio Doors start with the most advanced vinyl available. It’s extruded from Vision Group’s state-of-the-art equipment, using high-grade resins unmatched for durability, weight reduction and freedom from wear. The result is beauty, performance, and reliability - plus the widest selection of accessories, colours and upgrades on the market, Sunview continually strives for the highest level of buyer satisfaction. With one of the most comprehensive warranties in the industry, the company offers clients superior quality, uncompromising service and highly competitive pricing. For more information, call our toll-free number, visit our website, or join us on social media.